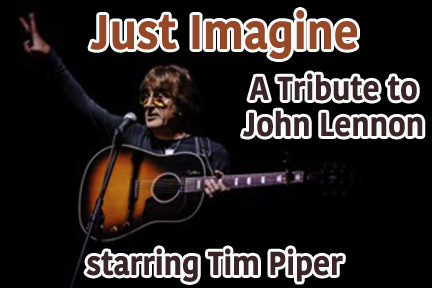 Just Imagine is the extraordinary rock ‘n’ roll celebration of the life and music of John Lennon starring look-and-sing-alike artist Tim Piper. Just Imagine intertwines John Lennon’s songs with the stories behind them to create a unique and electrifying multimedia concert experience. Backed by rock band Working Class Hero (Greg Piper on bass; Don Butler on guitar, Morley Bartnof on keyboards and Don Poncher on drums) Piper, who bears an uncanny resemblance to the late rock ‘n’ roll icon, channels Lennon in this critically acclaimed tribute. The show has played all over the U.S., Canada, Santiago, Chile, Liverpool, England, Calcutta and Bangalore, India, Canada, Spain, Italy, Mexico, China, Japan and The Caribbean.